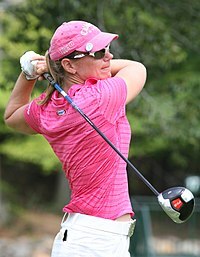 Annika Sörenstam won the title once representing Sweden. The Women's World Cup of Golf was a professional golf tournament contested by teams of two female golfers representing their respective countries. The tournament was played in two incarnations, first in 2000 at Adare Manor Hotel & Golf Resort, County Limerick in Ireland sanctioned by the Ladies European Tour, and later annually between 2005 and 2008 in South Africa sanctioned also by the LPGA Tour, money unofficial on both tours. The purse in the final year was US$1.4 million. The field consisted of twenty-two teams and each qualifying country could field one team. It was held in January or February, at the beginning of the season for the world's dominant professional tour, the U.S. LPGA Tour, and of other major tours such as those in Japan and Europe. World Cup of Golf - the equivalent event for men's golf.